To schedule or make adjustments to your Campaign's schedule, navigate to the required Campaign by first clicking Campaigns on the left-hand navigation bar. On the Campaigns page, you'll see a list of your Campaigns with details related to the purchase. 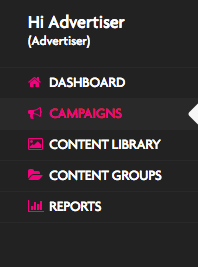 Find the Campaign you wish to adjust your scheduled content for and click the Manage button in the Actions column. On the Campaign Details page, you'll see the location or locations you've selected to be a part of your Campaign with several columns of details for each location. Continue on by clicking Manage in the Action column for the location. 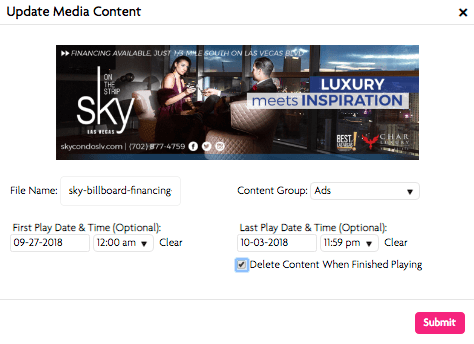 If you do not have content already scheduled, you can add content to your schedule by uploading content, adding content from your library or design content online. Details about the locations specifications can be found toward the bottom of the page. For this article, we'll assume you have content scheduled. If you don't, please review the article Managing content and schedules for a Campaign. Here we'll focus on the scheduling region of the screen. Be sure the Ad Content is selected and pink. Below is the main scheduling area, with buttons to access your content, the sequencing commands, and the schedule itself. In this image, each content piece has a number above its upper left hand corner signifying its order in the schedule. The first time this schedule plays, it will play item 1, the next time it will play item 2 and so on through to number 4. After number 4, it will start again at number 1. This will remove the numbered order of the content pieces in your schedule. The default mode is Select. When you are in this mode, you can select the new sequence of your content schedule by selecting each content piece in the order you'd like. As you select, a number will appear above left-hand corner of the content. If you select a content piece more than once, it will add additional plays for that content piece in order. This can be useful when you'd like a particular content piece in your schedule to display more frequently. Clicking on Select will change you to the Unselect mode. In Unselect mode, clicking on a content piece with only one number will delete it from the list. Clicking on an item with multiple numbers will remove only one play number. You can completely remove an item with one or more sequence numbers by clicking on the X oval at the top right-hand corner of each content piece. Any current sequencing will be re-ordered based on the position of the deleted content piece. If you have a content piece that you'd like to schedule but you'd either like it to start on a certain day or time, or expire on a certain day or time, click on the gray clock icon at the lower right-hand corner of the content piece. The Update Media Content screen will allow you to set both a first play date and time for a content piece, and pre-set a last play date and time. Using these options allows you to pre-schedule a change for the future or ensure that a dated event removes itself from the schedule without your needing to manually remove it. This can be especially helpful for content that advertises events that start or end in the middle of the day. If you won't be using the content piece again in the future, you may also click the check-box to Delete Content When Finished Playing. You can recognize a content piece that has special time scheduling by the pink clock icon in the lower right-hand corner below the content piece.